Will A New City Rise From Demolition Rubble in Kenya? 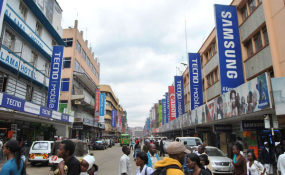 Electronics shop along busy Nairobi's Luthuli Avenue (file photo). County by-laws require that property owners repaint their premises every two years to maintain health standards. Nairobi Governor Mike Sonko has ordered owners of buildings within the capital city's centre to repaint their buildings during the festive season. Governor Sonko has said the move is aimed at restoring the city's lost glory as the 'Green City under the Sun', calling on the owners to also repair section of pedestrian walkways in front of their buildings. "I wish to encourage building owners to take advantage of this festive season when there will be lighter human traffic to bring back the aesthetic beauty of our city and improve the business environment," said Sonko on Saturday. Sonko made the directive on Saturday when he led the monthly clean-up exercise in Nairobi at Kiboro grounds in Mathare Constituency. "I understand the fiscal strain that this action will have on your businesses, but this will go a long way to restore the lost glory of our city," he added. The Governor later revealed in tweet that his administration would issue 2019 unified business permits to businesses in buildings and premises that have been repainted.